Our on-loan midfielder, Marko Grujic, has been enjoying an impressive season at Hertha Berlin. The rangy midfielder has made 16 starts for the Bundesliga outfit – including their past eight games – after returning from an ankle injury. His performances have drawn rave reviews, as well as admiring glaces from other clubs. Now, according to Turkish outlet Fanatik, it seems he could be on his way to Süper Lig side Galatasaray in the summer, who want to make a bid for Grujic in the close season. At only 22-years-old, his ceiling of development is still wide open; however, it seems that he would be keen on returning to Anfield to fight for his place in the first-team rather than opting for a move away. Marko Grujic had an issue at Liverpool where he was really erratic and incosistent with his passing and decision making when on the ball and under pressure or in tight areas, complete opposite as to what he’s like now. Confident, composed, calm & makes great decisions, always. 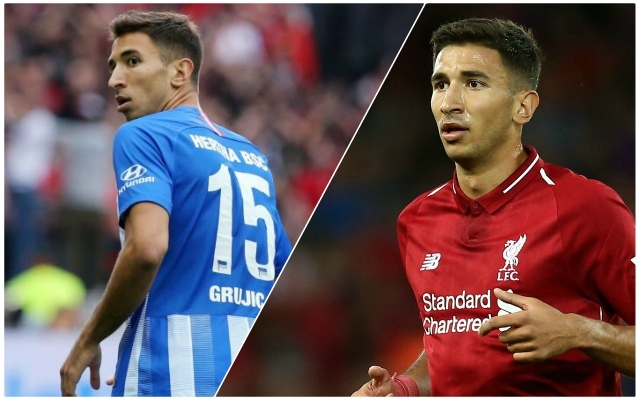 Grujic was Klopp’s first signing upon arriving at Liverpool in 2016 and the Serb may want to repay the faith the German initally showed in him. Moving to Hertha Berlin was a vital way of offering him further playing experience – it definitely seems to have paid off. But, with Fabinho and Georginio Wijnaldum establishing themselves as two of Klopp’s favoured options in a midfield three, plus the return of Alex Oxlade-Chamberlain and the eventual form-finding of Naby Keïta, Grujic may find his options limited next season. Don’t be surprised if Grujic ends up back out on loan next season; he’s still young and more games under his belt will only benefit the young midfielder. A permanent transfer to a club like Galatasaray is also an option but he’s very highly-rated at Liverpool, so don’t necessarily count on it.